Last week a coworker and I went on a field trip to the local public library to try out their microfilm machine. We're purchasing the same model for the college and, as it costs approximately the MSRP of a 2017 Nissan Versa, we needed to make sure it will be worth every penny. While I was there, I picked up a cozy mystery I've been dying to read ever since I saw the cover art in the online catalog. I won't share the specific title, but suffice to say it was adorable. The premise was brilliant and I was excited to crack open the paperback. You know how it usually ends when I get excited to read a book with a brilliant premise. For the first fifty pages, I couldn't put my finger on exactly what was wrong with this book. The author delivered the story she promised, but I wasn't enjoying it. The characters were quirky, but they somehow came across as flat. The setting was fabulous, but it somehow came across as drab. Then the heroine, whom we'll call Anne, meets a wealthy woman, whom we'll call Beth. In a brief one-page conversation, Beth drops hints about the shady past of a third character, Carl. Anne is suddenly obsessed with getting to the bottom of "what Beth was trying to say." She reads deep meanings into every move Beth makes. She sees profound significance in the way Beth glances at Carl across the room. I thought, "Hold on, Anne. You talked to this woman for one minute, and you already know all of her secret resentments and hidden agendas? Do you have heretofore unmentioned telepathic powers?" I realized that the author intended Beth to play a specific function: to introduce Carl as a mysterious character and spur Anne to dig into his past. All Beth really did was share some catty gossip. But Anne, as the author's mouthpiece, was carrying on as if Beth had revealed a great and terrible mystery. I thought back on the fifty pages before that. From page one, the heroine had been doing all the talking. The characters were flat by themselves, but they were supposed to be quirky because Anne said they were. The setting was drab by itself, but it was supposed to be fabulous because Anne said it was. This is the sort of thing that people blame on outlining. They point to examples like this and say, "See? This is what happens when writers outline. They sacrifice character and believability for 'how the story is supposed to go.'" But I've read sample chapters with the same problem from "pantsers" who made their stories up as they went along. The heroine would rant for pages about how much she hated a coworker, but the coworker really wasn't that bad. Or she'd act like her crush was the most fascinating man on planet Earth, but he was really as bland as a sodium-free cracker. This isn't a problem caused by a writer's process. It's a problem caused by a writer's over-reliance on telling. For readers to believe a conclusion, they have to come to it independently. To believe the heroine's coworker is a Class A Jerk, they have to see the coworker screaming at a pitiful intern for bringing him a lukewarm latte. Then readers will feel the same dislike the heroine does. To believe the heroine's crush is fascinating, they have to see the crush climbing a tree in an expensive suit to save a terrified kitten. Then they'll melt into warm fuzzies like the heroine does. Nobody will feel anything if you simply say, "He's such a jerk; I hate him so much!" or "He's super cool; I'm so in love!" Once I read the first chapter of an urban fantasy by a young man who was seeking advice through an online forum. In the opening scene, a dubious low-life uses his telekinetic powers to break into a house and steal cocaine. We'll call this character Dan. I told the writer he could make Dan more frightening by subtly emphasizing his villainy, showing him trampling over flowers and whatnot. The writer said, "I didn't intend for Dan to be a villain." The character was supposed to be sympathetic! I expressed surprise. "In this scene, Dan comes across as a thug with no redeeming qualities. It's not enough to tell us he's stealing the drugs because he's desperate. To make him sympathetic, you have to show us that he's a complex character." The writer's response: "I did that, right here: He had to do it. His basic survival was in jeopardy." 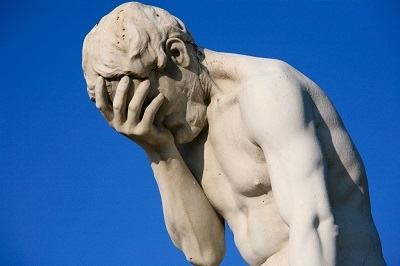 I believe the appropriate twenty-first-century expression is "facepalm." Writers who rely on telling aren't writing what they think they're writing. When this young man wrote, "His basic survival was in jeopardy," he thought he was writing, "His basic survival was in jeopardy." But he was actually writing, "Dan justified his actions by telling himself his basic survival was in jeopardy, but that was probably a gross exaggeration." Almost all modern fiction is told from the limited perspective of the point-of-view character, and readers know it. Adult readers take every sentence with a grain of salt, especially if they're fans of mysteries and thrillers. Knowing that the hero will make many erroneous assumptions before he figures out whodunnit in the final chapter, readers will try to judge the truth for themselves from evidence in the story. If the hero comes to an off-the-wall conclusion from the same evidence, readers will get frustrated with him (and the author). When the author of that disappointing cozy mystery wrote, "Beth was trying to tell me something, but what?" she thought she was saying Beth was giving Anne a clue. But she was really saying Anne thought Beth was giving her a clue. I, the reader, did not see anything in Beth's behavior that indicated she was communicating some secret knowledge. I was very annoyed, because when I pick up a cozy mystery I expect to identify with the heroine and root for her. Anne and I were clearly not on the same page and never would be. Of course there's one big exception: the unreliable narrator. A protagonist "telling" the reader things that are inconsistent with the evidence in the story can be used powerfully, if done on purpose. I admire the way Lori Rader-Day pulled this off in The Black Hour. In chapter one, the sardonic heroine comes back to work as a professor at an illustrious university. A student shot her at the end of spring term and left her permanently disabled, with only one fully functioning leg. The heroine tells the reader about her elitist colleagues, who always looked down on her because her degree came from a no-name state school. None of them want her to come back. They all wish she would quietly disappear so they could forget about the unpleasant scandal. "Welcome back!" Her colleagues beam and applaud. There's a sheet cake on the table with her name on it. The faculty congratulate the heroine on her recovery and joke that she sure took her time getting to the party. The truth hits the reader in the face: these people aren't callous snobs with nefarious designs to kick the heroine out of the school. They're well-meaning but oblivious academics who didn't think about how difficult it would be for a person with a physical disability to reach this room. By showing evidence that contradicts what the heroine tells the reader, Rader-Day succeeds in illustrating that the heroine has an inferiority complex that warps her view of the world. Sadly, most books I read are not as ingenious as The Black Hour. Usually when there's a difference between how I see characters/events and how the protagonist sees them, it isn't a deliberate ploy by the author. Instead the author thought she'd written one thing when she'd really written another. How to avoid this pitfall? 1. Take a hard look at what you're showing the reader. Read your manuscript, skipping all of the telling. Or copy the whole thing over to a new document and delete the telling. Every time the POV character passes a judgement (i.e., "My coworker is such a jerk," "The little bookshop was adorable"), that's telling. Every time you write straight up what a character is thinking or what motivates him (i.e., "He was desperate for cash," "The girl was head-over-heels in love"), that's also telling. If you remove all of the sentences in which you tell readers what to think, would those readers still come to the conclusions you want? If you don't tell readers the bookshop is adorable, would they still think it's cute as described? If you don't tell readers the girl is in love, would they get it from the way she speaks and acts? 2. Put yourself in the POV character's head. In the Intro to Psychology class I took as a freshman in college, the professor told us about an interesting study. The researchers asked students in a library, "If you walked through the security gate and the alarm went off, what would people think?" Most of the respondents said everyone would think they were trying to steal books. Then the researchers asked, "If someone else walked through the security gate and the alarm went off, what would you think?" The same respondents said they'd assume the person made a mistake. Maybe he forgot a book was in his backpack, or maybe the librarian at the desk didn't scan it properly. People tend to make erroneous assumptions about what other people would think and do in a hypothetical situation, but they're pretty good at guessing what they'd think and do themselves. Many pitfalls in fiction could be avoided if writers stopped asking, "What would this character do?" and instead asked, "What would I do in this character's place?" What would you do if you met a random woman who told you something bad about a stranger? Would you study her movements closely, looking for clues about the stranger's mysterious background? Probably not. You'd likely think the woman is an unpleasant gossip, and the stranger's past is really none of your business. If your aim is to give the heroine a reason to dig into this stranger's past, it has to be a reason that would also persuade you to dig into a stranger's past. What would you think if you were breaking into a house to steal cocaine? You might say, "Well, I would never do that." Exactly. The vast majority of people would never do it. Certainly none of your readers would ever do it. What could possibly make you so desperate that you would do it? The answer is what you need to show if you want readers to sympathize with this character. 3. Ask beta readers for feedback. Try as we might, we can never fully get rid of the rosy filter over our eyes that makes us see what we intended to write instead of what we actually wrote. There are some little tricks to help: change the font to see your manuscript with fresh eyes, print out the chapters to read on paper, read your writing out loud to the cat, or put the book away in a drawer for six months and read it again after you've forgotten most of it. But the only truly foolproof method is to ask other people to read it. Finding good beta readers is the tricky part. Fellow writers, in my experience, tend to think of themselves as editors even when you specifically ask for reactions, not advice. Friends and family might not be entirely honest because they don't want to hurt your feelings. And if they do hurt your feelings, or you hurt theirs by asking Friend X to read the manuscript but not Friend Y, there can be awkward ramifications for all. Since I haven't found reliable beta readers myself, I don't have any advice to give. Sorry, you're on your own! But you do need another human being to look at the story through an objective lens. If all else fails, there are many competent developmental editors out there who will help for a reasonable fee.